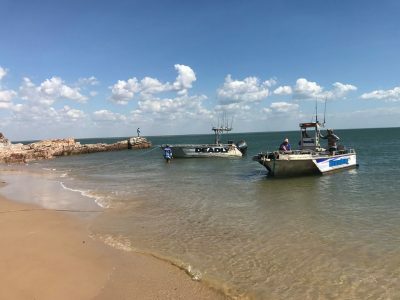 Just a lovely relaxing photo of Humbug Fishing’s, 6.5 mtr tenders anchored up for lunch along the way to the Kimberley from Darwin. Time to stretch the legs and enjoy a flick from the land or a casual walk along the pristine beaches. Humbug Fishing usually runs these 7 day charters during the dry season so Southern winter time. What a great way to enjoy winter! For a price on a 7 day charter and details about the trip just give us a call or email anytime.